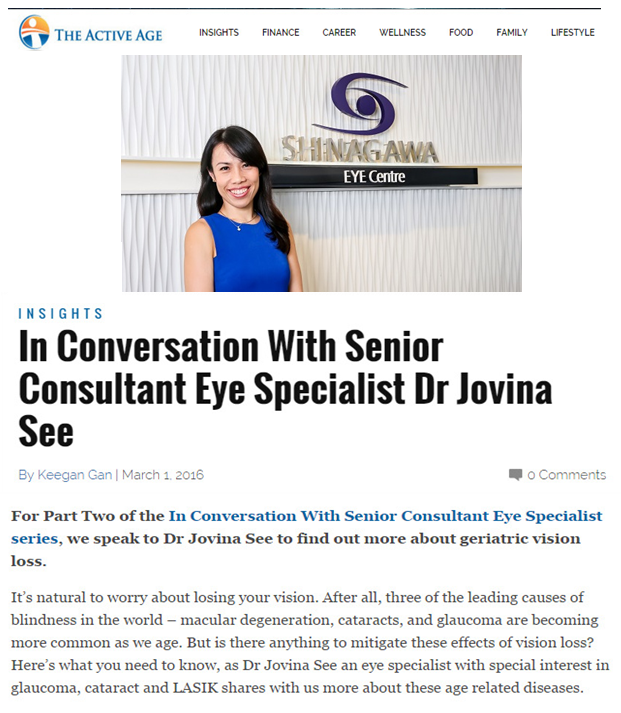 Dr Jovina See was featured in Active Age. Read on to find out more about Cataract, Glaucoma and Age-related Macular Degeneration. AA: Hi Dr See, for starters could you tell us more about ageing related eye diseases such as cataracts and glaucoma? DS: As we age, our body including many parts of our eyes, undergoes wear and tear and oxidative damage. The lens in our eyes undergoes protein degeneration and become increasingly opaque, blocking out light and resulting in dimming and deterioration of vision. Our trabecular meshwork (the filtering structure of our eye that allows the aqueous humour in the eye to drain out of the eye) also undergoes wear and tear, and its filtration efficiency decreases as we age. This results in an increase in the eye pressure, which if significantly high, can damage the optic nerve over time. This can lead to progressive blurring of our peripheral visual field and eventual blindness. AA: Are there preventive measures that can be taken to decrease the likelihood of developing such eye conditions? DS: Adopt a healthy lifestyle, with a moderate nutritious diet rich in anti-oxidants and regular exercise. Simple measures such as wearing sunglasses can protect our eyes from excessive UV light, which is associated with earlier development of cataract as well as macular degeneration. Smoking has also been found to greatly increase the risk of age-related macular degeneration, so avoid such unhealthy habits. AA: What does the healing process entail after receiving treatment for the condition? DS: Post-surgery, good healing is dependent on keeping the surgical area clean to prevent infection. This includes daily cleaning of the eyelids and avoiding tap water or any other contaminants from getting into the eye in the initial postoperative period, as well as avoiding rubbing the eyes. Being compliant with the eye medications prescribed by your doctor and showing up for your scheduled follow-up appointments helps to ensure good healing. Adopting a healthy diet rich in vitamins and anti-oxidants can also help to ensure good healing. AA: Can you tell us more about IOLs? DS: There have been tremendous improvements in the design of intraocular lens implants (IOLs). A variety of mono focal and multi focal lens implants are now available. While the former allows for good clarity for a single distance (usually far vision), the latter IOLs allow for greater convenience by allowing patients to enjoy good vision for near (reading), intermediate (computer distance) and far distances, without having to rely on their reading glasses. Astigmatism can also be treated with toric lens implants. Before proceeding with cataract surgery, be sure to ask your doctor to explain the pros and cons of the various lens implants that are available, so that you can choose the lens implant that is best suited for you. AA: As for IOLs, are there specific limitations on my vision and eye care after receiving such implants? DS: Upon full recovery (which usually takes about a month) post-cataract surgery, normal routine eye care may be resumed. Good eye habits must, of course, still be maintained. AA: What is retinal detachment and how is it related to the above surgery procedures? DS: Retinal detachment (RD) occurs when the retina develops a tear and fluid enters this tear to cause the retina to detach. This usually arises spontaneously without any eye surgery, especially in high myopes (those who have high myopia) where the eyeball is long and the retina, being more stretched, is thinner and more prone to breaking down. RD can also develop after eye trauma. Eye surgery that is complicated can be associated with an increased risk of RD.